After the demise of iView, Expression Media, and PhaseOne MediaPro, many people came over to NeoFinder to have a modern, 64-bit future proof DAM solution. 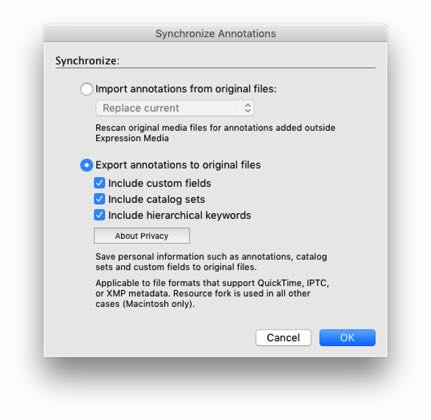 As iView and NeoFinder have different approaches, some of your workflows will have to be modified. On this page, you will find a couple of helpful tidbits for the transition. The best news first: Your existing valid iView, Expression Media, or Media Pro license entitles you to a cross-grade! Please contact our sales team for details. 2. Import or catalog again? To get existing data (especially your metadata, ratings, keywords, and such) over from iView to NeoFinder, you have two choices. You can either export the iView data to a XML file, and import that in NeoFinder. Or you use iView to write back all your keywords, ratings, and annotations back into the original files (where they belong), and let NeoFinder simply catalog these. Select "Export to XML..." from the File menu in iView. Please make sure that the options in that dialog are exactly as shown here. It is very important that the DTD is NOT included in the export file, but that you do include the Thumbnails, so that these can be imported into NeoFinder properly. 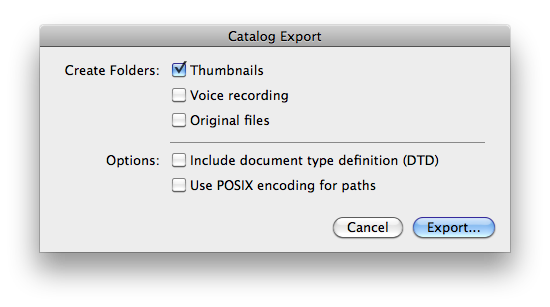 Also, please make sure that the "Use POSIX paths" is turned OFF, that will make the Import easier for NeoFinder. Instead of using the kludgy iView Exporter and the NeoFinder Importer, you may alternatively wish to add the keywords, descriptions, ratings, people, and all that to the actual photo files from inside iView, so that NeoFinder can immediately catalog the original photos quickly, with all metadata intact and available. That will cause iView to write back all metadata you have added to your actual photo files, so that NeoFinder and other applications in your workflow can pick them up immediately. Just like NeoFinder does it. That way, you can just catalog the actual photos with NeoFinder, no Export or Import needed. If you used Catalog Sets extensively, you need to know that NeoFinder uses the term "Albums" for these. NeoFinder also offers Album Groups, where you can group together your Albums in multiple levels. NeoFinder 7.4 will soon be able to read the iView CatalogSet metadata out of photo files, and rebuild them for you when cataloging these files. Many iView users have used custom made web gallery templates. NeoFinder 7.4 will be able to use most of them with usually very few changes required. iView had offered a special metadata field for Persons or People. NeoFinder 7.4 will soon be able to read, display, edit, and write these as well. If you have further questions, we are delighted to hear about them! Please contact us.